In this crazy world of people telling you what you should do and how you should live and manipulating you out of your money, we sometimes want to throw in the towel and say that nothing matters. We can lose track of what’s important in our work when we think that how other people treat us or react to us impacts what we should be doing. Your work matters and you should be doing it to the best of your abilities, no matter what. In the Parable of the Talents (Matthew 25:14-30), Jesus gives us an example of three people who were given things to be responsible for, as they had ability to do. The first two were faithful and worked hard, took risks, and, as a result, they had more to give back than what they started with. They are the good and faithful servants. The final servant protected what he had and gave back only what he’d been given. He was cast out as a disobedient servant. There are four things we can pull from this parable. First, what we have has been given to us based on our ability. God isn’t going to ask you to be a brain surgeon and then not give you the intelligence to handle the job. We’re also not given everything equally. God gave out as He saw fit, not as would make sense to us. We need to accept what we have as a gift and a responsibility. Second, we have to take risks and work hard. The first two servants invested the money and made more. Any type of investment, whether it be simply interested based loaning or market trading or business investing, all of these things take risk. There might be ups and downs, but we have to keep believing in the gifts and abilities we have and we have to keep working hard. Third, staying as you are is an act of disobedience. Money is what is used in the parable as an example, but money isn’t the only things that we’ve been given to take care of and grow. We have many talents and responsibilities that we have to take care of and learn to improve at. It can be anything from taking care of our families to leadership abilities or business growth. Whatever it is that we have, we must use and improve or we are being bad stewards of our gifts. Finally, the fourth thing we can learn is that God won’t always spell out in a step by step direction what we’re supposed to be doing. In the parable, the landowner gives these talents to the stewards because he is going away for a while. God never leaves us (Hebrews 13:5), of course, that’s not what the parable is saying. It’s saying that we are able to do what we need to do without constant guidance. Part of accepting the work that God has called us to do requires us to believe that we have everything we need to accomplish it, including the abilities to complete our work. 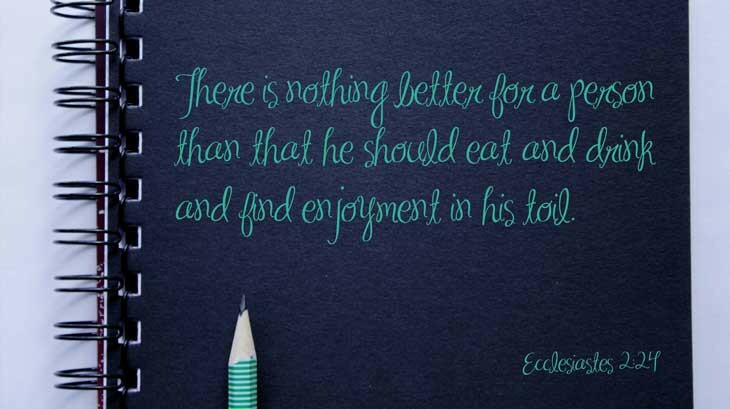 Ecclesiastes 9 talks about the toil that each one of us has before us to do. 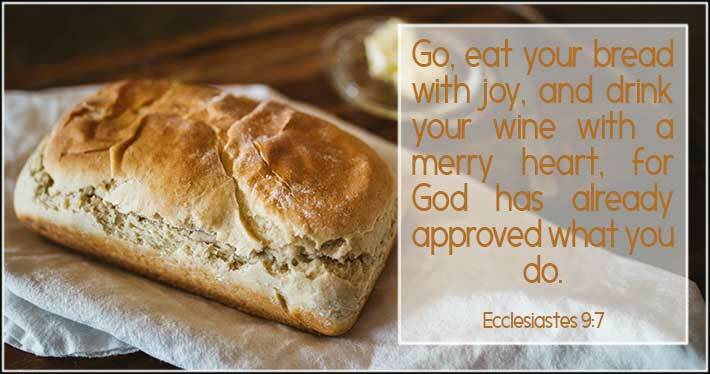 In verse 9 it says about this, “Go, eat your bread with joy, and drink your wine with a merry heart, for God has already approved what you do.” God wants us to work hard and what He’s given us. Don’t spend time worrying about your lot in life or the things that you wish you had or didn’t have to deal with. Pray about finding you “merry heart” in regard to what you’re doing and learn to enjoy the moment in your life as you work every day to be who He made you to be. When we hear “You’re here for a purpose,” what do you think? Many people seem to think that it means that you are going to be accomplishing a pre-set list of things. What if, however, there is a broader meaning to purpose that can open up some powerful truths for living? In 2 Chronicles 14-16 we meet a king of Judah who was a Godly king, Asa. He sought the Lord and he fought against the idolatry in his lands. Among the other events of Asa’s life, we see two battles that he fights. One, he fights with purpose and one he fights without it. The results? He wins both. The first battle is Judah verses the Ethiopian army. Asa goes before the Lord and he asks for the Lord’s help and blessing. He acknowledges that they fully rely on the Lord for victory. The Lord gives them victory and much riches and spoil are collected from the army and the surrounding cities. The next battle happens much later in Asa’s reign. After many years of peace, the king of Israel decides to cause trouble with Judah. Asa, being savvy, goes to their ally with a big army: Syria. He sends them money and asks them to break their treaty with Israel. Syria agrees and the ensuing fighting sends Israel packing back home. Asa comes in and takes over the land they had encroached on and gains all the spoils they left behind. From an outside perspective, Asa won both battles and he gained material goods in both cases. Once cost some money and one cost a fight, but they both ended up in a way that benefited Asa and Judah. We can’t stop reading there though. The Lord wasn’t as pleased with the second outcome as the first one. 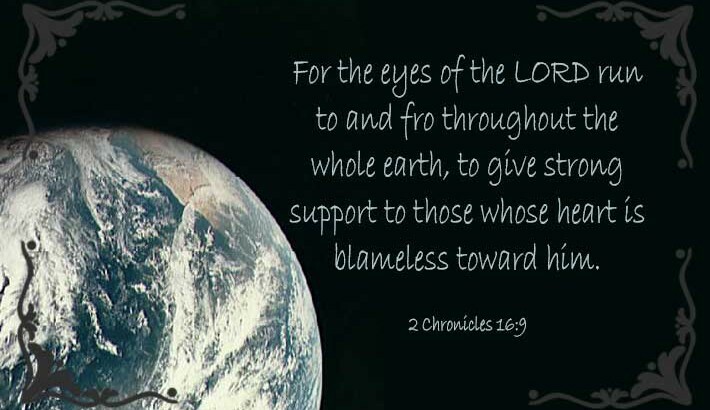 A seer comes to Asa with a message, “For the eyes of the LORD run to and fro throughout the whole earth, to give strong support to those whose heart is blameless toward him. You have done foolishly in this, for from now on you will have wars.” (2 Chronicles 16:9 ESV) Asa’s reign that had years of peaceful living was now doomed to trouble. In fact, Asa ends up not putting the Lord first and ends up being cruel to his people and suffering from disease (vs. 10, 12). Our purpose is to put God first and let Him take care of accomplishing what He sees is good for us. When I think about a picturesque view and see fields full of wildflowers and valleys full of crops, I don’t often think of joy as the emotion that I associate with it. However, when I stop and think about what these nature scenes represent, I can completely relate to the emotion of joy. 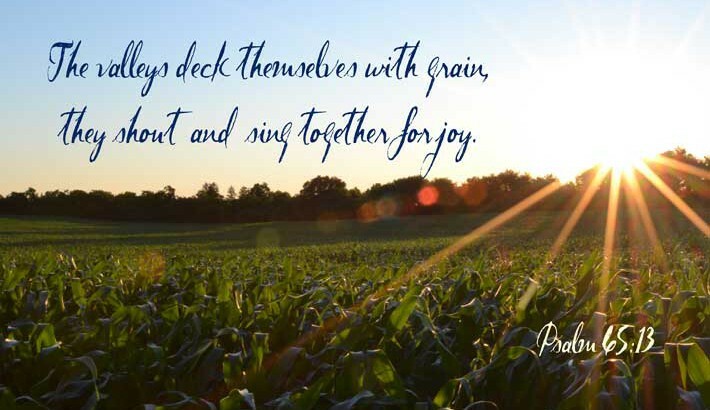 When a field is full of grain, whether it be in the middle of the season or full or ready to harvest plants, that field is living in to the utmost what God made it to be. These two verses show the earth allowing God to bring about good work and fulfilment out of them. They are achieving the things that they were created to achieve. For me, I can relate to this in times when I’ve felt connected with what I’m doing. I’ve had moments when I knew that I was where I was supposed to be doing what I was supposed to do. These moments are so joy filled that it completely passes circumstances. Allowing God to fill my moments and direct my days means that He is directing my time and energy to fill up with the things that He uniquely created me to do. There is no greater joy than that! As pleasant as these moments are, I hope to continue to grow in this awareness so that, like the scripture verse, I can put on joy (vs. 12) and I can join in the chorus of praise to God for His oversight and His blessings.